Being either professional or amateur vloggers means that you are equipped with a top-notch camera for YouTube which is the greatest platform for vlogging. But if you are just on your way to becoming a worldwide famous vlogger, this article is going to facilitate your search for the best camera for YouTube. Everyone knows that choosing the cream of the crop is a tough task. Every time you think you have found the best of the lot there appears a new item that outshines everything you have seen before. And this process may seem to be endless. But if you know exactly what to check before the purchase and what features the best YouTube camera must have, its selection won’t be so tiring and time-consuming. Here are some tips to remember when choosing a camera for YouTube vlogging. What are you going to capture? In order to decide which type of video resolution will be suitable for your vlogging it’s important to take into account the type of videos you want to produce. Sure, there is no camera with a sign “special for family vlogging” or something like that. However, if you know what you are going to capture it’s easier to find a suitable product. If you need a camera for indoor videos only, then a budget DSLR camera may be enough. At the same time, vloggers who capture videos mostly outdoors won’t be satisfied with the same camera. Good lighting is one of the key features they should look for and cheap cameras can’t offer it. Besides, outdoor vlogging can require a highly portable camera especially if it’s about traveling or kids life. When looking for a YouTube camera you will find different types of products. All of them have their own pros and are more suitable for certain situations. Everyone knows that Digital Single-Lens Reflex camera is great for top-notch shots. Such a camera will be also a nice option for vlogging. It allows you to change lenses and control ISO and depth of field. In addition, DSLR camera provides good low light performance and excellent image quality. On the other hand, it is pricey, usually heavy and bulky. Besides, DSLR camera will require time to learn how it works. You can check our list of the best DSLR cameras. Unlike DSLRs, these cameras are light what makes them more portable and suitable for outdoor vlogging. Mirrorless cameras also include interchangeable lenses and produce accurate images. Need something really compact? Point and shoot cameras are the best option in such a case. Still, keep in mind that they aren’t as powerful as DSLRs or mirrorless cameras. This type of cameras is designed for an immersive perspective. Action cameras are usually strapped to your body, so you can easily go scuba diving or paragliding with them. What is more, they are small and comfortable to carry. Still, action cameras can’t boast of top-notch video quality like DSLRs. Content isn’t the only thing that affects vlogging success. Whatever cool topic you are capturing it won’t bring you the best result if it’s of poor quality. So the first feature your YouTube camera should have is high video quality. OK, there’s no doubt that superb video quality is great but what is really hidden behind these words? The best cameras have a big sensor size and high resolution. The latter one is especially important for videos. Here are the main types of resolution a camera can have: HD, FHD and UHD. Let’s have a look at the main difference between them. HD cameras offer only 720p resolution. In a word, that’s not enough for high-quality videos. Such cameras can be used as a budget option but if you need something really powerful then it’s better to avoid them. Full HD resolution is the most popular nowadays. It’s a kind of happy medium on which you won’t spend a fortune but its final result will be quite decent. So, if you need a budget camera for YouTube videos pay attention at items with FHD resolution. Still, the best camera you can choose for vlogging would be the one with 4K resolution. Remember that Ultra HD cameras are quite pricey, but the video quality they offer will blow your mind and will make your audience excited about it. YouTube camera should also have a proper frame rate. One may think that the higher it is the better quality it can provide. Unfortunately, if you are YouTube vlogger this rule doesn’t work. High frame rates are cool, especially for high-speed actions like marathons but if it’s a beauty vlog then 60 fps will be too much for it. The most popular frame rates for YouTube videos are 24fps and 30 fps. Another crucial point to take into account before you purchase a camera is IS, aka image stabilization, as no one wants to get a low-quality image spoiled by various blurs. Almost all modern cameras include IS option. There are three types of it – digital, dual optical stabilization. You can learn more about them here. There is no doubt that a camera should be comfortable in use. The display is one of those parts which are responsible for this characteristic. Make sure it is easy to operate especially outdoors as not all of the cameras provide clear image in the direct sunlight. If you need a camera for shooting, audio quality may not be of high importance. But everything is absolutely different with YouTube videos. Obviously, a weird piercing voice won’t make your video more popular. All cameras are equipped with a built-in microphone. Your task is to make sure that its quality is high. Note that DSLRs have much better sounding than action cameras. Anyway, you can always get an external mic for your camera to make it perfect for your vlogging. Sure, YouTube vlogging presupposes an access to the Internet. So, if you are one of those enthusiasts who like sharing videos immediately after you have captured them, then the option of Wi-Fi will be a great bonus for you. This feature is important for outdoor vloggers. If you are a travel vlogger who works in the heavy rain then weather sealing is an integral part of your future YouTube camera. But if you go even further and take videos about underwater life then look for a waterproof camera. The last but not least thing to take into consideration before your purchase is the size of the camera and its weight. Remember that there are different types of cameras we have mentioned above, which vary in characteristics and have their own advantages. Canon G7 X Mark II is a point and shoot camera with exceptional image quality. It comes with a big 1.0-inch 20.1 Megapixel CMOS sensor and DIGIC 7 image processor, which provides an excellent detection and tracking functions. Thanks to its optical image stabilizer, which reduces image blur, all shots are always smooth and clear. This point and shoot camera has also got a good continuous shooting speed – up to 8 fps. By the way, it supports JPEG as well as RAW modes. Keep in mind that this Canon camera doesn’t provide 4K video recording but it offers Full HD video at 60 fps. Sure, it seems to be a great drawback especially if you need a camera for making videos, but there are some other options which can compensate for this drawback. Its compact and lightweight design attracts lots of customers who prefer pocket-sized cameras. Besides, there is a built-in flash which guarantees great results in almost any lighting conditions. This camera can also boast of a fast 4.2x optical zoom. Another great camera from Canon for YouTube is EOS 80D. It is designed with 24.2mp (APS-C) CMOS sensor which is able to take high-grade shots as well as videos. Besides, this image sensor delivers refined individual pixels which are responsible for high ISO speeds. Note that Canon EOS 80D offers ISO 16,000 for still photographs and ISO 12,800 for movies. This DSLR camera comes with Intelligent Viewfinder which displays AF points and modes and has a grid display with a horizontal electronic level. Its continuous shooting speed reaches up to 7 fps. EOS 80D is really good at catching fast-moving subjects as it is provided with the Dual Pixel CMOS AF that guarantees the high speed of tracking in Live View. Canon EOS 80D has got a built-in Wi-Fi and NFC connectivity which allows sharing photos immediately. What is more, using the camera Connect app you can shoot remotely from a distance even in Live View. This representative of new Sony generation has a range of impressive features due to which it stands out from the other modern cameras. And the first one which makes Sony RX100 VI so unique is the world’s fastest hybrid AF system with the speed of up to 0.03 sec. Note that this AF system covers both contrast and phase options. What does that mean? You get a chance to capture every second of the life around you. Except for fast AF system and great shooting speed of 24 fps Sony RX100 VI comes with extra zoom and hefty image stabilization which takes care of the image sharpness and accuracy. This camera is regarded as one of the best for YouTube because of its 4K video support and excellent slow-motion mode. Though it’s not the easiest one to use it’s much cheaper than buying professional gear. Another bonus this Sony camera has is its tilting touch screen. Such options as Touch Focus and Touch Shutter make the shooting easier and more convenient. Besides, you can always change the monitor position in a way you need it. Going to impress your subscribers with some underwater videos? Then GoPro HERO7 is definitely worth your attention. It comes with a set of features which are necessary for top-notch video recording and provides great shots as well. This underwater camera is designed with hyper smooth video stabilization, so every shot or record is smoothed and clear. There is also an option of time warp video as well as 8x slow-motion video. GoPro HERO7 supports 4K video at 60 fps and offers an option of Live Streaming using which you can share your impressions and results with others. It’s a durable camera that has a rugged waterproof body and can work at a depth of up to 33ft (10m). GoPro HERO 7 has also got a touch screen and voice control what makes it a perfect camera for extreme adventures. Besides, it’s really easy to use thanks to its intuitive menu. Need a mirrorless camera for your YouTube channel? 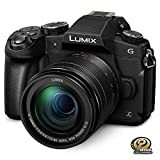 Have a look at Panasonic Lumix G85. It offers both 4K and FHD60 video support. As this Panasonic camera comes with 5-axis dual image stabilizer there is a nice handshake correction. In addition, there is a great shutter shock reduction provided with a new electromagnetic drive. As a result, the shock, as well as a noise caused by the diaphragm movement, is reduced. Panasonic Lumix G85 is designed with built-in flash. Its body is weather sealed, splash and dust proof. It is also well-rugged, so it can survive various challenges. Its ergonomic design makes Lumix G85 comfortable to carry even with one hand what results in stable shots. This camera is also a good option for shooting. There is a 16mp digital live MOS sensor without a low pass filter which delivers detailed and sharp images. But keep in mind that it shows quite poor low light performance. Panasonic Lumix G85 supports different file formats including RAW. Olympus has also something to offer YouTube users. Its E-M10 Mark II model has a large OLED electronic viewfinder with 2.36 million pixels to make sure you will see everything you need for a perfect shot. There is also a fast burst shoot at 8.5 fps. Such shooting speed allows you to use this camera for capturing fast-moving subjects with all the details and sharpness. Though E-M10 Mark II omits 4K recording capability, it provides decent 1080p video recording at 60 fps. Besides, you can choose between fine and superfine video quality as well as a record mode (24, 25, 30, 50 or 60 fps). You can also record a video at 180 fps but to do this you will need to reduce the resolution to 480p. This Olympus model has a solid construction and a nice retro look. The layout of buttons is comfortable and easy to use. Thanks to a compact design this model is also a great option for travelers. 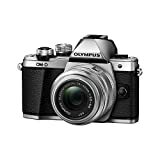 What is more, Olympus OM-D E-M10 Mark II has an affordable price. Just starting your YouTube channel? Then we have something special for you. Nikon D3500 would be a great starting point for any novice in the field of photography or filmmaking. This camera offers a special in-camera guideline which will help you make the first steps in taking top-notch shots and videos. So, what does it come with? Nikon D3500 has a 24.2mp APS-C image sensor, EXPEED image processor and an optical viewfinder. There is also 11-point autofocus system and continuous shooting at 5 fps. Its native ISO range covers ISO 100 to 25,600. As it’s not a high-end model there is no option of 4K video recording. This camera offers only 1080p Full HD mode. Nikon D3500 is a nice camera for traveling as it is one of the smallest and lightest Nikon DSLR cameras. This camera is also equipped with Wi-Fi and Bluetooth connectivity. So, if you want to share you photos with friends you can do it immediately after taking shots, but keep in mind that you need SnapBridge app for this. Canon EOS 77D is designed with HDR and time-lapse movie options. Its optical viewfinder provides a great control of what you are capturing while its vari-angle touchscreen LCD guarantees easy and comfortable use. You will also like its Movie Electronic IS that reduces image blur when recording videos. By the by, there are also options of NFC, Wi-Fi and Bluetooth connectivity. In case you need a camera that will survive anything then Olympus TG-5 is one of the first ones to check out. 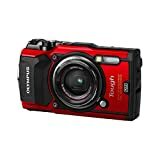 It has a durable build quality which includes not only weather sealing but also some other great features which allow this camera to work in the blue waters of oceans and cold snow. Olympus TG-5 is waterproof up to 50ft and freeze-proof up to -10°C. What is more, this camera is not afraid of unexpected drops as it is shockproof up to 7ft and crushproof to 220lbf. In a word, it can overcome almost any YouTube challenges. In addition to this, it has a very reasonable price which won’t make you cry over a broken camera body after a failed experiment. This camera guarantees smooth videos as it supports 4K recording. Besides, there is image stabilization which reduces blurs caused by handshaking. Olympus TG-5 is good at taking shots as well. Though there is only 12mp image sensor, its shooting speed reaches up to 20 fps. Here’s another camera for YouTube worth your attention. Sony a7 III is a top-notch mirrorless camera which provides excellent video recording and shooting. It is designed with 24.2mp 35mm Exmor CMOS full-frame back-illuminated image sensor. This Sony camera has also got an interchangeable lens and a wide ISO range of up to ISO 51,200, which can get even more expanded for stills (up to 50-204,800). Its autofocus system is fast and updated. Sony a7 III has a hybrid AF with 693 phase-detection and 425 contrast detection AF points. There is also a shooting speed of 10 fps and an option of face detection focusing. Sony a7 III provides 4K video recording as well as 5-axis image stabilization to smooth all the blurs. This model has weather sealing and also such features as Wi-Fi, Bluetooth and NFC connectivity. Its articulating touch screen makes this camera easy and comfortable to use. Still, its main drawback is a high price. Striving for great videos you will definitely try to find the best YouTube camera. To do this, remember to check all the criteria mentioned above and choose the most suitable item for your successful YouTube vlogging.